"Six players on the trail of a half a million in Cash. There's only one question... Who's playing who?". 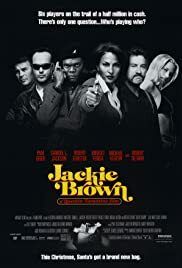 Jackie Brown is a flight attendant who gets caught in the middle of smuggling cash into the country for her gunrunner boss. When the cops try to use Jackie to get to her boss, she hatches a plan—with help from a bail bondsman—to keep the money for herself. Based on Elmore Leonard's novel “Rum Punch”.